It’s a little bit odd that this is the first time I’ve written about roasted chicken. I make it when company comes over. I make it when the Husband comes home from a business trip (it’s his favorite)! I make it for New Year’s Day, then I make it again for Easter. 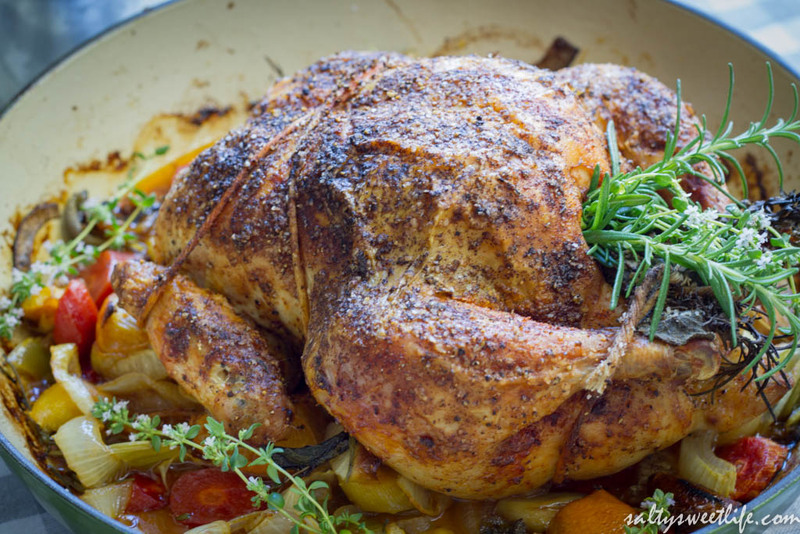 Really, is there anything more satisfying than a perfectly roasted whole chicken? Golden brown, crispy skin with a perfectly juicy interior; it is comfort food at it’s finest, yet it can be a perfectly elegant centerpiece of a “fancy” dinner. 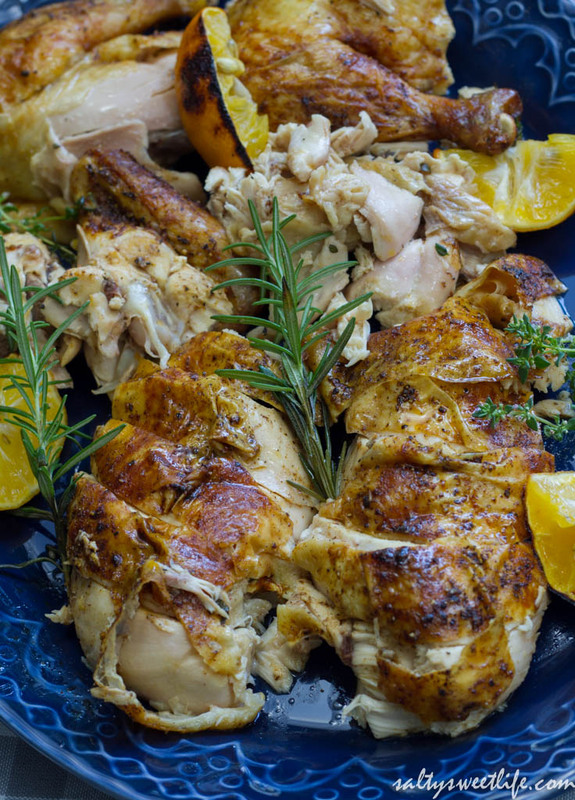 Seriously, bringing a well-roasted, plump chicken to the table is a beautiful thing. It’s like the Thanksgiving Turkey without all the anxiety! The Husband brags about this chicken to his friends and colleagues, and I admit, it makes me smile…a lot! There’s no sweeter feeling than when someone you love enjoys something you’ve made so much! I learned the method of cooking this chicken from a Barefoot Contessa episode many years ago and I’ve made it so many times I could make it in my sleep! The method is simple and the most complicated part of it is assembling all the ingredients. 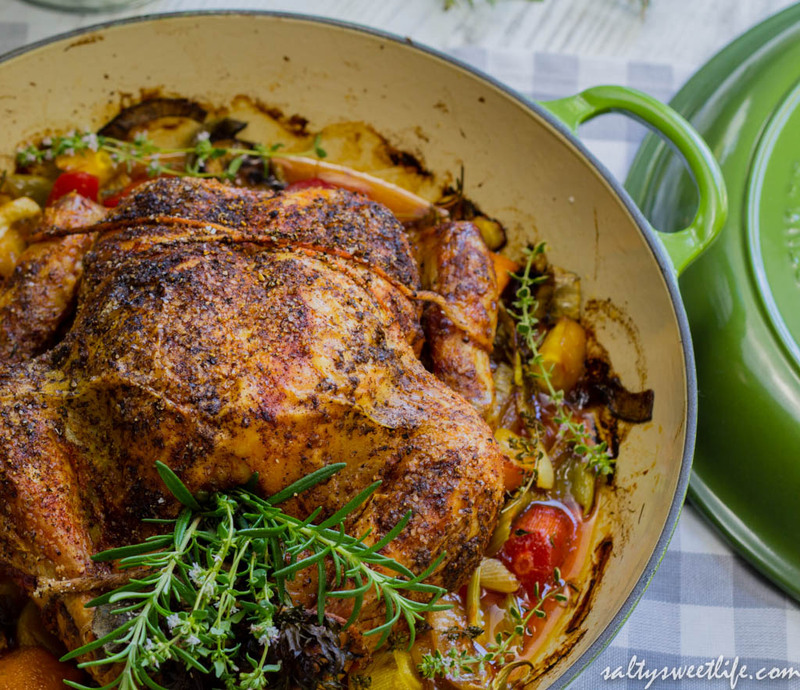 Start with the best quality whole chicken that you can afford and load it full of aromatics–fresh herbs, garlic, onions, lemons. Then season it until you think you can’t possibly add more seasoning and then season it some more! Truly, the chicken can take it and I have never over-seasoned a roasted chicken. This chicken roasts uncovered for 90 minutes in a fairly hot oven. The high temperature sears the skin of the chicken and traps all the juices inside. You don’t need to baste it or fuss with it at all once it goes into the oven. If you absolutely must do something (and I get it, I get antsy, too) around the 45 minute mark, you can rotate the roasting pan so that the chicken cooks more evenly and give the vegetables a quick stir. Then go have a glass of wine and put your feet up (or wash the dishes, whatever you prefer)! Start with a nice, plump chicken. A 4 to 6 pound chicken is the perfect size for this cooking method. I always use a “natural” bird and not a pre-brined bird because I like to be in control of the seasoning. 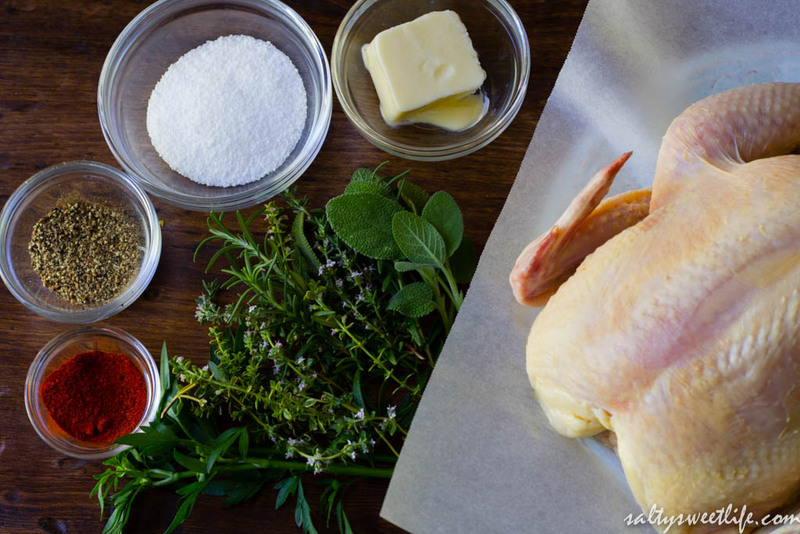 Before roasting the chicken, allow it to come to room temperature and pat the chicken completely dry inside and out before seasoning it. Dry skin is crispy skin! Don’t be afraid of seasoning! 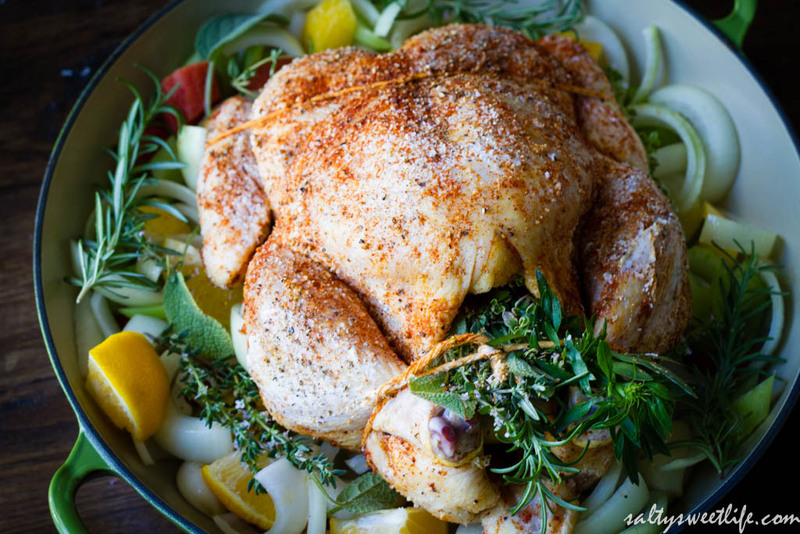 Use loads of fresh herbs in and around the chicken and be liberal with dry seasoning. Don’t forget to season the inside of the bird and around the neck as well. 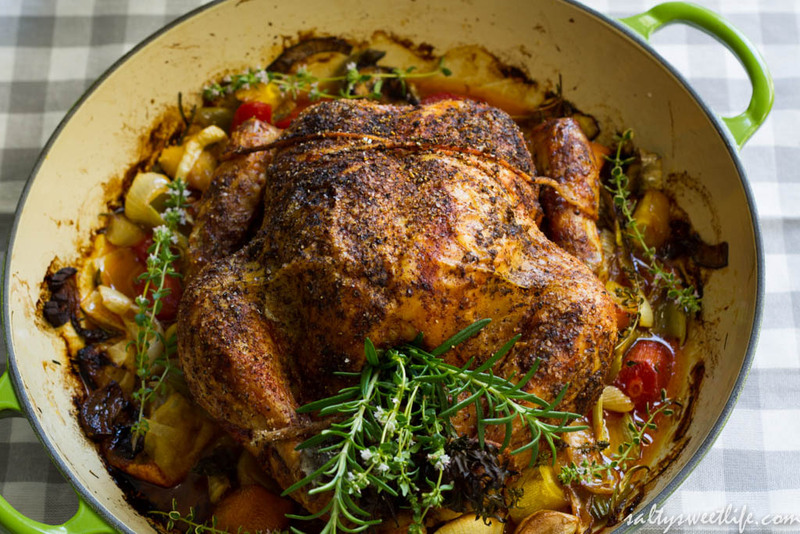 Every bit counts and you want to have a well-seasoned, flavorful bird. Don’t pierce the chicken while it’s cooking or the juices will run out and you’ll end up with a dry bird. And finally, don’t dare cut into that chicken until you have let it rest for at least 20 minutes! So, now that we have the important stuff covered, let’s start roasting! Mise en Place – I grew all these herbs myself! Prepare the chicken by rinsing it inside and out. Remove any giblets. Now, I know that there has been recent talk about not rinsing chicken, but I still do it. I place the chicken in the sink and gently run water over it to avoid excess splashing. Dry the inside and outside of the bird with paper towels and set the bird on a sheet of parchment paper. Allow the bird to come to room temperature while you prepare the vegetables. Chop 1 1/2 onions into thick slices. Chop the carrots and celery into 1 inch pieces. Peel the garlic cloves and lightly smash them with the back of a chef’s knife. Cut one lemon into eighths. Place the seasonings into small prep bowls. Your fingers are going to get messy and you’re not going to want to touch your spice containers with messy chicken hands. 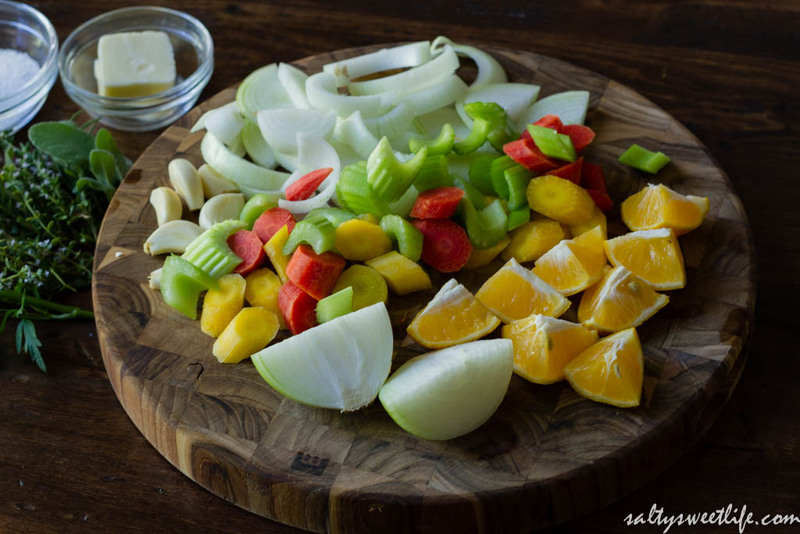 Place the carrots, celery, 4 cloves of garlic, the sliced onion and the cut lemons in the bottom of the roasting pan. Drizzle a little olive oil over the vegetables and stir to coat. Generously season the inside of the chicken with salt and pepper. Rub the softened butter all over the chicken, then season the chicken liberally with the salt, then the pepper, cayenne pepper and smoked paprika. Discard any unused seasonings and butter. Cut the remaining lemon in half and place inside the cavity of the chicken. Cut the remaining 1/2 onion in half and stuff that into the cavity as well, along with the remaining two garlic cloves. 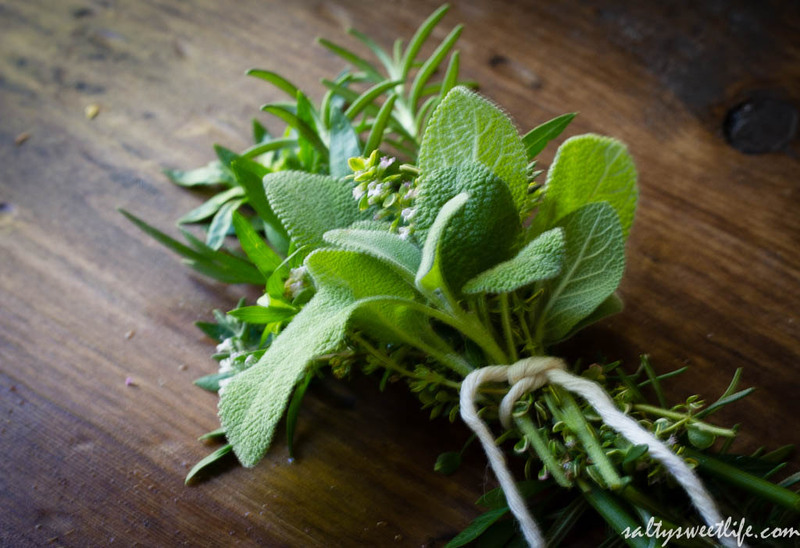 Tie the sage, thyme, rosemary and parsley with a short length of twine and stuff the entire bouquet into the cavity. Tuck the wings under the chicken, then truss the chicken with a length of butcher’s twine. This is not rocket science, you are simply pulling the wings and the legs snug to the body. Place the chicken on top of the vegetables in the roasting pan. Tuck additional sprigs of thyme, rosemary and sage around the chicken. Roast for 90 minutes. After the chicken is done, allow the chicken to rest for at least 20 minutes before carving. I hope you enjoy this chicken as much as we do! One of these days I’ll have the husband do a carving tutorial! After you’ve carved all the meat from the bones, save the carcass to make stock! And homegrown herbs… Hell yea!! That last picture is soooo divine! I’m sitting here puncturing my strawberries in wine but all I can think about is that last picture!! Haha! Thank you!! It’s only two of us and let me just say, there were not a lot of leftovers! Oohh, strawberries in wine!! I’d better go see what you’re up to over there! I don’t think any recipe I post would be considered “difficult”–just some may require more hands-on fun than others! Glad you liked the tips and don’t be intimidated! It’s very doable! If you try it, please let me know how it turned out! Hi! This looks divine! Thanks for stopping by #TheWeekendSocial and linking up! I have pinned, stumbled and shared your link across social media. I hope to see you again next week! Thank you Ronda! I will certainly stop by next week! I hope you had a great weekend! Yep, I still have to rinse my chicken off and I mean thoroughly! This looks great Tracey! Love all the tips! Thanks Christina! Yeah, I just can’t NOT rinse. Does.not.compute. Glad you liked the tips! What have you been up to lately? Girl, is your presentation for real?? I don’t think I could ever be able to make anything look so pretty. Seriously. I would put your bouquet garni in a vase and call it a centerpiece because it is that lovely. One day I will pull off a very rag-tag version of this. There will be a chicken, It will taste delicious. But it will look like a hot mess, because that’s what I do best. Haha! Thank you! Yup that’s real presentation! The thing about a whole chicken is that it never looks rag-tag no matter what! Let me know what you think if you make it!